Glass sliding system with an aluminium anodised track that can be directly soffit or side fixed to a structure without the need for brackets. High quality 4 wheel hangers with nylon tyres and bearings. 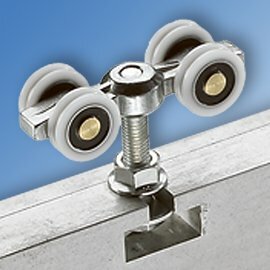 Kit includes a clip-on pelmet, end stops, end plates, door guide and handle. Glass requires drilling only for the handle or if door is over 2m high.